Once again, I’m peeved off at the Central Government Office For Croats Outside the Republic of Croatia as well as with the Croatian consular/diplomatic services around the world for failing miserably at properly informing those they are paid to serve (all the Croats living abroad) of important opportunities to be taken for the promotion and nurturing of Croatian identity and culture. Publishing information on a website that’s not accessed by many due to relative lack of knowledge about it, is not good enough and they – the Office – know it. Is it truly, here also, still like it was under the communist Yugoslavia regime: government/party officials keeping information to the general public about accessing government grants to a minimum so that family and friends can have a better chance at receiving the grant – and forget the public and its right to full access – full access includes thorough or accessible information (?). How hard is it to write a Press Release and send it off to the world – after all this government office for Croats living outside the Republic of Croatia has some 50 individuals representing Croatian clubs or associations – the so-called government advisors – from all over the world serving as its link to the diaspora, as well, and I’m pretty sure they would pass on the message to the people if given a chance by the Government Office. 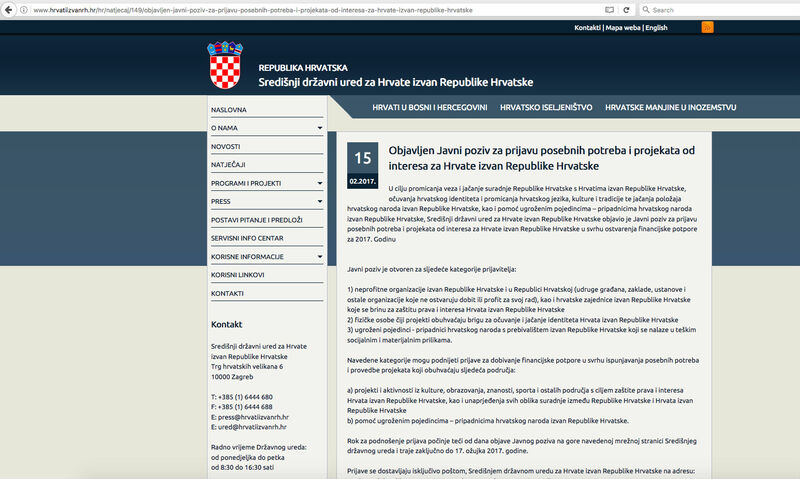 It’s been a whole week since that office announced February 15th on its website some very important news regarding the opening of applications for government grants for “special needs and projects of interest for Croats outside the Republic of Croatia” and there’s nothing about it that I have come across in the diaspora media or Croatian Embassies/Consulates. On the Office’s website there’s a page for information in the English language but last time anything of news seems to have been posted there in English was May 2015! Go figure! Why have that Page on the website at all? It’s like pulling someone’s leg! “With the aim to promote links and strengthen the cooperation between the Republic of Croatia and Croatians outside the Republic of Croatia, to preserve the Croatian identity, promote the Croatian language, culture and traditions and to strengthen the position of the Croatian people outside the Republic of Croatia, as well as to help endangered individuals – members of the Croatian nation outside the Republic of Croatia, the Central government office for Croats outside the Republic of Croatia has released its Public invitation for the registration of special needs and projects that are of interest to Croats outside the Republic of Croatia with view to realising financial support for 2017. 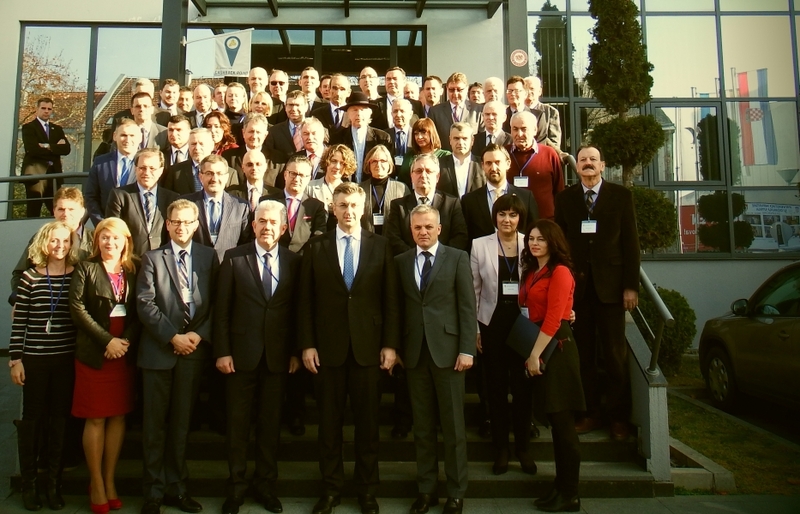 3) endangered individuals – members of the Croatian nation who reside outside the Republic of Croatia and are in social and financial hardships. b) assistance for endangered individuals – members of the Croatian nation outside the Republic of Croatia. Applications must be sent by post to the Central government office for Croats outside the Republic of Croatia (Središnji državni ured za Hrvate izvan Republike Hrvatske) at the address: Trg hrvatskih velikana 6, 10 000 Zagreb, marked „za Javni poziv“ (for the Public invitation). The highest amount of the financial grant that may be received in all categories is 80,000 kunas and the application results will, according to the published guidelines (CLICK HERE FOR PDF VERSION IN CROATIAN LANGUAGE), be within 60 days of applications closing dates. Well now – it’s almost March 2017 and if this case of public invitations for applications for grants open to Croats living abroad is anything to go by (and I’m certain it is) then that “togetherness being born again” Milas spoke of has some mighty harsh labour pains and complications. How can togetherness thrive when information flow and opportunities are blocked or simply weak and, hence, disrespectful of the diaspora or the Croats outside Croatia for whom that same information and those same opportunities are meant in the first place? I’m not saying that the Central Government Office For Croats Outside the Republic of Croatia isn’t a good idea, but don’t forget during whose tenure this office began. As I recall, it all started the same way as this program – hidden information about the hiring program, meaning those with “old” connections had a huge advantage. So it’s no wonder that the m/o is similar. I’d like to hear the answer to this one question on this subject: If it’s in the Office’s best interest to reach the widest number of people outside of Croatia, HOW MANY parishes were informed and how many church bulletins had information about this or past programs? You are right Brankec on all points – the nominations for positions reached barely 40% of diaspora and yes the previous Social Democrats led government had probably in mind only the photo opportunities a couple of times a year with diaspora but that does not mean that this new government can’t do better (?) – we shall see but it stinks, communication with diaspora stinks, it’s an embarrassment/ How hard is it these days to spread the word if you want…. I have faith in Zvonko Milas. He’s as honorable as they come. He just hasn’t held the helm long enough yet to clean house. Ina, you are not a political friend. Therefore you should have no optimism. From Facebook: It certainly is hit and miss. Our group found out about it today – slučajno – from our Zagreb supplier of folklore/ costume supplies.